It's possible to shop for low-cost toner for the MFC-8460N model with the best rated shop, Cartridge Save. Opt to purchase from a company who have been 100% set up for stocking only premium grade Brother toner coupled with seriously low prices and our helpful service. Shop for your replacement toner cartridges online with us and just forget about scouring local stores to get toner cartridges for the Brother MFC8460N printer. Each individual MFC-8460N toner cartridge that we sell has a extensive thirty day money back policy for total satisfaction. Don't forget to remember everything for sale comes with 100% free delivery, which ordinarily arrives the next working day! To get bargain deals, fabulous customer support as well as completely free deliveries, choose Cartridge Save! The Brother MFC-8460N promises high-speed copying, faxing, scanning, and printing even over an Ethernet-based network. The automatic document feeder is one of its key time-saving features. This multifunction printer is also praised for its intuitive LCD display and high-yield toner cartridge, but unfortunately, its B/W laser technology may be too outdated for the needs of some users. This multifunction printer is made for offices that require a no-fuss monochrome printer that comes with a fax machine, scanner, copier, and PC fax capabilities. It has a Super G3 33.6 Kbps fax modem that transmits messages at about 2 seconds per page, and the built-in automatic document feeder lets users multitask. Unlike the fax, copier, and printer, the scanner of the Brother MFC-8460N can scan in colour. The entire machine weighs in at a bulky 15.24 kg and with measurements of 18.7 inches tall, 17.7 inches deep, and 20.9 inches wide, you must set aside a fair amount of space to accommodate the MFC-8460N. 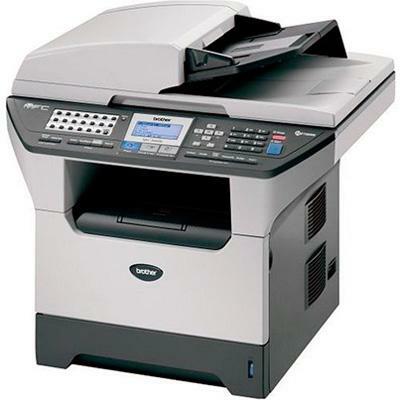 The Brother MFC-8460N has built-in document memory backup, a 50-sheet ADF for the scanner, fax machine, and copier, and a scan-to-email or scan-to-PDF feature. The toner cartridge is high-yield, so users get lower costs per page. Network-ready, the Brother MFC-8460N can easily be integrated into a small group of computers via Ethernet, or connect to a single unit via the built-in parallel or USB interface. The paper capacity can be expanded up to 550 sheets for bulk printing. The B/W laser technology of the Brother MFC-8460N can be a drawback for users that require colour printing, faxing, and copying using their multifunction device. Some users complained about the poor scanner quality even when it is already configured to a high 19200x19200 dpi resolution. Apart from those issues, the Brother MFC-8460N is noisy (55 dB of sound) and lacks direct-printing features.